Mortgage rates are on the rise. Could that derail sales? According to First American’s Potential HomeSales model, even if the 30-year fixed-rate mortgage rose to 5 percent, the impact on the housing market would be modest. First American’s Potential Home Sales model estimates the potential for existing-home sales based on market fundamentals. The market potential for existing-home sales based on current fundamentals is 6.11 million at a seasonally adjusted annualized rate. If the 30-year fixed-rate mortgage rose to 5 percent, the impact would be a slight decline to 6.1 million existing-home sales, according to the model.12 months. For the first time in history, California's median home price hit $600,860, according to the California Association of Realtors (CAR). The record was based on home sale prices in May and was up 2.8 percent from April and 9.2 percent from May 2017. California's median-priced home — where half of the homes sold below that number and half sold above— is more than double the national median home price of $264,800. California's median price previously peaked at $594,530 over a decade ago, according to CAR. 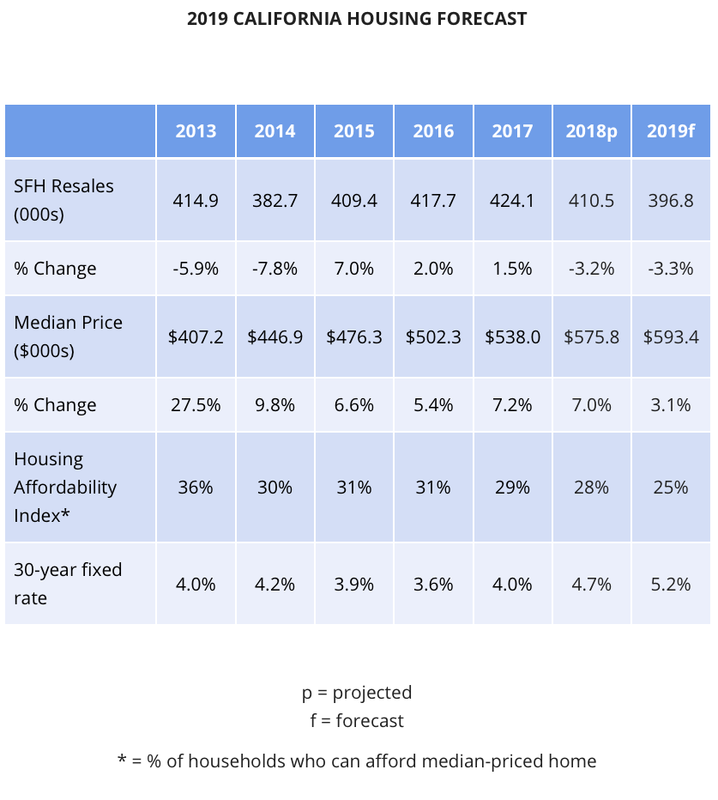 "As we predicted last month, California's statewide median home price broke the previous pre-recession peak set in May 2007 and hit another high as tight supply conditions continued to pour fuel on the price appreciation fire," CAR Senior Vice President and Chief Economist Leslie Appleton-Young said in a press release. The upward pressure on prices is caused by a major shortage of housing supply in the state, particularly in the bottom end of the market where homes are priced below $200,000. In the last year, availability of those homes declined by nearly 29 percent, while the supply of homes on the market priced at $1 million and up increased by more than 18 percent. Still, buyer demand is in high gear. The median time it took to sell a single-family home in California in May was 15 days. If you have an adult child living at home, you could become an empty nester sooner than you thought. The number of 18- to 34-year-olds living with parents last year edged down from 2016, according to new data from CoStar Group, a commercial real estate information company in New York. Last year, 31.5 percent of that age cohort were living with Mom and Dad, down slightly from more than 32 percent in 2016. While still higher than the long-term average of under 28 percent, it's a downward trend the firm expects to continue due to the strength of the job market and overall economy. advisory services at CoStar. "We also should see some wage gains in that age range. ... Both of those things help." Cohen said the tight labor market — overall unemployment is about 3.8 percent — has led to a higher rate of workforce participation among younger adults. • Mortgage application volume increased 5.1 percent from the previous week, according to the Mortgage Bankers Association's seasonally adjusted survey. • The gain was driven by applications to refinance a home loan, which rose 6 percent for the week but were still 31 percent lower than a year ago, when interest rates were lower. • The average contract interest rate for 30-year fixed-rate mortgages with conforming loan balances ($453,100 or less) remained unchanged at 4.83 percent, with points decreasing to 0.48 from 0.53 (including the origination fee) for 80 percent loan-to-value ratio loans. For the first time in more than two years, when it comes to price, homebuyers and sellers are finally moving closer together. Market mismatch – Trulia’s measure of the price gap between search interest and available listings – is flat from a year ago, but has dropped 15 percent, falling to 11.1 from 13.1 the previous quarter; the first such drop since prior to the start of 2016. In other words, more homebuyers are searching at price points where listings are more common. • What looks like good news among very tough market conditions for starter home buyers comes with some hefty caveats. Rather than being a story of increasing inventory meeting high demand for starter homes, instead, searches are just shifting increasingly toward pricier options. • Nationally, the mismatch gap shrunk to 11.1 from 13.1 last quarter as the share of searches for starter homes fell to 28.7 percent from 31.1 percent. While part of this shift could be attributed seasonality, it is the first quarter to quarter drop we have seen and compares with a mismatch increase from 9.7 to 11.1 during the same period last year. • It’s not all good news though as the starter listing’s share continued to slide and is now down to22.4 percent of all listings from 22.8 percent last quarter and the first quarter of 2017. • Premium buyers got pinched this quarter for the first time in more than two years. Premium home searches made up 41.4 percent of all searches and comprised 52.5 percent of listings. Still comfortable, but down from a larger gap of 38.4 percent of searches going to 51.5 percent of listings last quarter and on par with the mismatch a year ago. • What looks like starter home buyer relief on a national level may just be signs of shoppers giving up. Recent changes are driven by search activity growing more slowly for starter homes than for trade-up and premium homes. • San Francisco saw the biggest improvement for starter home shoppers from last quarter as starter inventory increased to 40.2 percent from 36.1 percent of all listings and searches to those homes dropped to 42.7 percent from 45.5 percent of all searches. Home prices and sales increased last month in Southern California and across the state, with median house prices hitting their highest levels since the summer of 2007, the California Association of REALTORS® reported Thursday, May 17. According to a report by Zillow, the average time it takes for owning a typical U.S. home to make more financial sense than renting that same home is down by about one month over last quarter. The new average is 1.96 years. That means it would take roughly one year and 11 months for it to make more sense to own a home in the U.S. than to rent that same home. Not surprisingly, break-even horizons are longest in expensive coastal markets like Los Angeles, Portland and Washington D.C. This translates to a roughly two to three-year break-even horizon. Los Angeles has the longest breakeven horizon at 3.7 years. Making sense of the story:Under the newly amended Senate Bill 827 from Sen. Scott Wiener (D-San Francisco), cities would be allowed to restrict building heights to four or five stories, down from a maximum of eight stories, within a half-mile of rail and ferry stops. Wiener also limited changes surrounding bus stops. The new version of the bill wouldn’t mandate height increases around bus stops, insteadallowing for increased density and lower parking requirements. It also would apply only at bus stops with frequent service throughout the day, rather than just during rush hour. SB 827 tries to address the state’s longstanding shortage of homes and a push by climateregulators to build near mass transit through dramatically changing development rules,particularly in the state’s largest metropolitan areas. Earlier versions of the bill would haveaffected nearly all of San Francisco and, according to a Times analysis, about 190,000 parcels currently zoned for single-family homes in Los Angeles — roughly half such parcels in the city. Additional changes to the bill made this week try to address concerns relating to the promotion of gentrification. All projects greater than 10 units will have to set aside a portion for low- income residents. It further restricts the demolition of rent-controlled or formerly rent- controlled properties. And the developers will have to provide monthly recurring transit passes to all residents at no cost. About one in five conventional mortgage loans issued this winter went to borrowers who spent more than 45 percent of their monthly incomes on their mortgage payment and other debts. This is the highest proportion since the housing crisis, according to CoreLogic, a real estate data firm. Further, that is nearly triple the proportion of such loans issued in 2016 and the first half of 2017. Real estate professionals told WSJ that they are concerned a growing number of buyers are becoming priced out of the housing market. Besides rising home prices, the average 30-year fixed-rate mortgage has increased to 4.40 percent, compared to 3.95 percent at the beginning of the year, according to Freddie Mac. Rising mortgage rates “are working against affordability and that’s why you get the pressure to ease credit standards,” says Doug Duncan, Fannie Mae’s chief economist. That's leading mortgage financing giants Fannie Mae and Freddie Mac to test programs aimed at making homeownership more affordable. For example, they’re experimenting with backing loans made by lenders who agree to help pay down a buyer’s student loan debt or programs that ease standards so that self-employed borrowers can get a mortgage more easily. Also, last summer, Fannie Mae and Freddie Mac started to back a greater number of loans from borrowers with debt-to-income ratios of up to 50 percent (45 percent was usually the typicallimit prior). Fannie’s new policy has added 100,000 new mortgages that wouldn’t have otherwise beenmade last year and early this year, according to the Urban Institute. It’s not news that the homebuying market, and the economy, were very different 60 years ago. But it’simportant to emphasize how the factors that created the homeownership boom in the ’50s—widespread government intervention that tipped the scales for single-family homes, more open land for development and starter-home construction, and racist housing laws and discriminatory practices that damaged neighborhoods and perpetuated poverty—have led to many of our current housing issues. • Closed escrow sales of existing, single-family detached homes in California totaled a seasonally adjusted annualized rate of 422,910 units in February, according to information collected by C.A.R. • The statewide annualized sales figure represents what would be the total number of homes sold during 2018 if sales maintained the February pace throughout the year. It is adjusted to account for seasonal factors that typically influence home sales. • February's sales figure was up 3.3 percent from the revised 409,520 level in January and up 5.4 percent compared with home sales in February 2017 of a revised 401,060. The year-to-year increase was the largest since March 2017, and the month-to-month increase was the largest since June 2017. • "February's solid market performance was likely fueled by rising interest rates, which motivated buyers to rush in and close escrow before rates move even higher as they're anticipated to do in the coming months," said C.A.R. President Steve White. "Despite losing ground in January, February's strong sales gain more than covered the loss, resulting in a 1.1 percent increase so far this year." • While the statewide median price slipped from January, it continued to grow at a strong year- over-year pace and has remained above the $500,000 mark for a full year. The $522,440 February median price was down 1.0 percent from January's $527,780 and was 8.8 percent higher than the revised $480,270 recorded in February 2017. The year-over-year price gain has been growing at or above 7 percent for eight of the past nine months. As expected, the Federal Reserve announced Wednesday that it is increasing the federal funds rate for the first time in 2018. Earlier this year, observers placed the likelihood of the Fed increasing rates by 25 basis points at the end of its March meeting at more than 75%. And Wednesday, that’s just what the Fed did. Citing the strength of the economy, the Federal Open Market Committee voted to increase the target range for the federal funds rate to between 1.5% and 1.75%. Previously, the target range was 1.25% to 1.5%. “Information received since the Federal Open Market Committee met in January indicates that the labor market has continued to strengthen and that economic activity has been rising at a moderate rate,” the Fed said in a statement. “Adulting” is getting harder for younger generations, which is stymieing the housing market from reaching its full potential, according to Freddie Mac’s latest March Insight report. The report compares young adults to previous generations and the impact to household growth. Compared to 2000, the average annual expenditures of young adults in 2016 has jumped 36 percent. The average annual expenditures on health care and education have more than doubled, according to the report. Housing costs and labor market outcomes are the two biggest factors behind the decline in household formation rates among young adults, according to the insight report. From 2000 to 2016, real median home prices rose by 29 percent. However, young adult per capita incomes increased by only 1 percent. Further, the labor force participation rate for young adults has seen a “substantial decline in recent years, particularly for men,” researchers note. Under the new rules, smaller banks (those with less than $250 billion) won’t have to participate in yearly Federal Reserve “stress tests” that determine where they’re equipped to handle economic and market downturns. Those smaller banks say they would get relief from restrictive rules and that will encourage more lending. The gap between an appraisal value and homeowner expectations widened in January – reversing course for the first time in eight months. The National Quicken Loans Home Price Perception Index (HPPI) showed appraisers valued homes an average of 0.6 percent lower than what owners estimated. 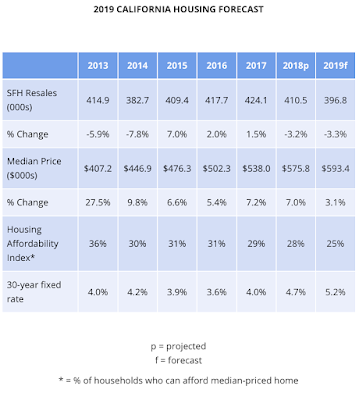 Despite the slight difference in perception, the Quicken Loans Home Value Index (HVI) – the only measure of home value change based solely on appraisal data reported climbing home values. On a national level, appraisal values increased 0.46 percent from December to January. The annual growth was even stronger, with home values jumping 7.03 percent from the same month of the previous year. • Nationwide existing home sales decreased in January, seeing the largest annual decline in more than three years, according to the latest release from the National Association of Realtors. • Total existing home sales, completed transactions that include single-family homes, townhomes, condominiums and co-ops, decreased 3.2% in January to a seasonally adjusted annual rate of 5.38 million, down from a downwardly revised 5.56 million in December. Sales are now down 4.8% from last year, representing the largest annual decline since August 2014 and the slowest pace since September’s 5.37 million. • The national median existing home price for all housing types in January was $240,500, up 5.8% from January 2017’s $227,300. This marks the 71st straight month of annual gains. • Total housing inventory nationwide at the end of January increased 4.1% to 1.52 million existing homes available for sale, however, this is still down 9.5% from the year before, and has fallen annually for 32 consecutive months. Unsold inventory now stands at a 3.4-month supply at the current sales pace, down from 3.6 months last year. California’s population is growing faster than builders can add housing, driving up rents. Incomes, meanwhile, aren’t keeping up. As a result, it takes three full-time minimum-wage incomes to afford a two-bedroom apartment. Here’s how rising rents are affecting the state and, in particular, Southern California. Rates for home loans have reached a nearly a four-year high as investors abandoned bonds in the face of stronger signs of inflation and central bank tightening, sending yields on debt higher. Getting a mortgage is, by general consensus, the most treacherous part of buying a home. In a recent survey, 42% of home buyers said they found the mortgage experience “stressful,” and 32% found it “complicated.” Even lenders agree that it's often a struggle. A 20% down payment is the golden number when applying for a conventional home loan, since it enables you to avoid paying private mortgage insurance (PMI), an extra monthly fee of 0.3% to 1.15% of your total loan amount. But with mortgage rates where they are today—in a word, low—waiting for that magic 20% could be a huge mistake, since the more time passes, the higher mortgage rates and home prices may go! Mortgage pre-qualification and mortgage pre-approval may sound alike, but they’re completely different. Pre-qualification entails a basic overview of a borrower’s ability to get a loan. You provide a mortgage lender with information—about your income, assets, debts, and credit—but you don't need to produce any paperwork to back it up. In return, you’ll get a rough estimate of what size loan you can afford, but it's by no means a guarantee that you'll actually get approved for the loan when you go to buy a home. The national homeownership rate reached its highest level since the fourth quarter of 2014, increasing slightly in the last quarter of 2017, according to the Quarterly Residential Vacancies and Homeownership report from the U.S. Census Bureau. The homeownership rate remained statistically unchanged, inching up to 64.2 percent in the fourth quarter. This is up from 63.7 percent the year before and 63.9 percent in the third quarter. Among Millennials, the homeownership rate ticked up slightly from 35.6 percent to 36 percent. Among older generations, the homeownership is significantly higher at 75.3 percent for those aged 55 to 64 years and 79.2 percent for those aged 65 years and older. “What's even more positive news for the housing market is that much of the increase in the homeownership rate over the past year has come from 18 to 44-year olds,” Trulia Chief Economist Ralph McLaughlin said. Among the non-Hispanic white population, the homeownership rate increased from 72.5 percent in the third quarter to 72.7 percent in the fourth quarter. However, homeownership rates for other ethnicities are much lower. The black homeownership rate increased 0.1 percentage point, but remains far below average at 42.1 percent in the fourth quarter. The Hispanic homeownership rate saw the highest increase, rising .5 percentage points to 46.6 percent. The national homeowner vacancy rate decreased 0.2 percentage points from last year at 1.6 percent, while the national vacancy rate for rental housing remained unchanged at 6.9 percent. California was home to 13 of the nation’s 20 “hottest” housing markets in January, with San Diego ranking sixth, according to new data from Realtor.com. In San Diego, the typical home was on the market just 46 days, compared to 89 days nationally. In San Jose, the center of Silicon Valley, the market moved even faster with homes selling in 33 days. “There is no doubt that housing in many parts of California is as hot as the Mojave in August,” said Javier Vivas, director of economic research at the Realtor.com, which is the official website of the National Association of Realtors. A new report by the Brookings Institution’s Metropolitan Policy Program, The Millennial Generation: A Demographic Bridge to America’s Diverse Future, examines how this generation, poised to become ever more consequential on economic, cultural, and governmental levels, is changing—and where it’s settling across the country. The Brookings Institution looked at the group through many lenses, including homeownership rates, education, and poverty. Analysis of U.S Census data shows an increasingly diverse generation: 55.8 percent are white and nearly 30 percent are what the authors called “new minorities,” namely Latinx, Asian, and those identifying as two or more races. Thirty of the 100 largest metro areas are now minority white, including Miami (25 percent) and Houston (32 percent). Census data revealed where they are, and aren’t, moving to and living in across the country, which some see as a type of proxy for a city’s economic health.